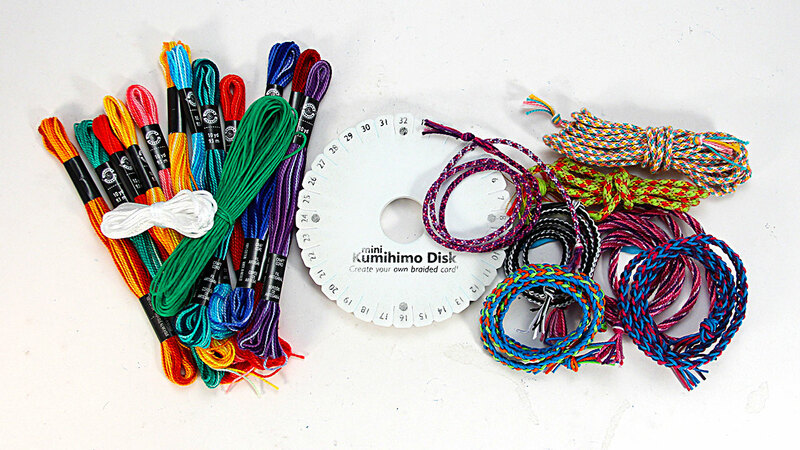 Learn how to choose your own colors and raw materials to create three unique braids called Kumihimo. The art of Kumihimo dates back to the time of the Japanese samurai when armor was laced together with little braids. Today, Kumihimo is a way of repetitively braiding cords and fibers into a beautiful strand with the help of a slotted foam disk. As far back as I can remember, I’ve been a maker of something. I’ve been trying to recall the first time I made “some thing” but there is no definite memory, although I do remember being a preschooler, sitting on the counter watching my mother make bread. I’m sure she did that to keep me occupied, but without realizing, she set me on my path of creativity. I learned that successful baking most often required a good recipe, the ability to decipher fractions, that a teaspoon was radically different from a tablespoon and how important it was to be accurate when measuring. I learned that there were times when it was permissible to put one’s own spin on a dish and that was always my favorite part! When my mother took a beginning knitting class, I went with her although I had no interest in knitting or intention to try it. I’m sure I was included in the class because she didn’t have a baby sitter, but she made me feel special by telling me that I would be the only young person allowed to attend. Smart lady! I learned to knit during her class and I loved it. Once again the spark of creativity within was fueled. Making things has served me well. I’ve used my “making” skills to sustain me through difficult moments in my life. I’ve made things as gifts when money was tight and I’ve often made things just for the sake of making - just to be creative because as I know understand, creativity feeds my soul. This class, How to Create Kumihimo Braids s05e02, began months ago when I noticed a funny looking foam disk with numbers around its edge. Once I really saw it, I began to see it again and again. Such repetitive occurrences usually mean that I need to figure it out! I read about Kumihimo and learned that it was first created by finger-loop braiding and then with a beautiful wooden tool called a Marudai. The art of Kumihimo dates back to the time of the Japanese samurai when armor was laced together with little braids. Amazing! Today, Kumihimo is a way of repetitively braiding cords and fibers into a beautiful strand with the help of a slotted foam disk. My Kumihimo curiosity was triggered such that I could no longer ignore it when I read an article in a sewing magazine where the hand-created braids were used to embellish handmade garments. From that point, a new obsession was born and I braided everything I could get my hands on. I failed a lot but I succeeded a lot, too. From all those trials, you’ll get to learn three different beautiful braiding patterns. We’ll be using a foam Kumihimo disk and fibers that are easy to braid. The best part? You get to choose the colors you like to make unique braids for your creative projects. Are you ready? Be sure to download your class notes and I’ll meet you in class.